hollingsThe Maker’s Mark Secretariat Center (MMSC) is located in the Kentucky Horse Park in Lexington, Kentucky. Founded in 2004, with major donations from Marylou Whitney, the late Dr. Frank Lyons, and Maker’s Mark, through their Triple Crown commemorative bottle sales, the MMSC gives off-track Thoroughbreds a world stage in the heavily trafficked horse lovers destination. Retraining at MMSC is based on the Horse Centered Reschooling Program, developed by MMSC Director Susanna Thomas. I caught up with Thomas, who just recently announced a new satellite location for MMSC in Illinois. The MMSC is a TAA-accredited organization. DP: What is your background in horses and how has it influenced the mission and work at MMSC? ST: Horses have been my lifelong interest and passion. I grew up a horse crazy little girl in New York and in Europe, and was constantly seeking out ways to be close to and to learn about horses. Because of where I have lived, I have an eclectic background with horses. In addition, I am ceaselessly curious and forever fascinated by the art, philosophy and science of horses and horsemanship. Over the years I have competed in dressage and hunt seat, done extensive groundwork training, foxhunted, driven carriages and I’ve ridden sidesaddle. I taught riding, spent many years writing for horse magazines, worked in many aspects of the racing industry from working with broodmares, breaking yearlings, working at the sales, being a vet tech, night watching, and breeding a few sport horses. Add all of this to my holistic approach to wellness in life–a constant balance of–mind, body, spirit, relationship–and what we get is the Horse Centered Reschooling Program, a training methodology where each of these factors is addressed to give the horse the best chance of success in whatever job it is being asked to do. When I took over the Center in 2008, I wanted to move as many horses as possible but in doing so, I had to stay true to my personal beliefs and make sure that we were fulfilling our duty to the horses in every way. You sometimes feel in the business of racing, the best interest of the horses isn’t or can’t always be the number one priority. The horses have to fit into the racehorse mold–perform or move on. That makes sense at the track, but not so when putting horses up for adoption. The end goal is to make sure that these horses have successful new careers and homes. The best way to achieve that in my opinion, is to make sure that each horse is prepared for a new job, and placed properly. Instead of running horses through the center speedily because that is the foremost need of the industry, we flip the ratio and make each horse’s individual needs the focus first. Taking the time it takes, as expeditiously as possible–we do whatever is necessary to give every horse the best chance to succeed in a new job and to have longevity in a new home. Education matters, right? As Alois Podhajsky, head of the Spanish Riding School always said, “one makes haste slowly with horses.” So we go as fast and as slow as we can and it has really paid off because we have adopters who love our methods and approach, very few mismatches and many, many repeat customers who want an additional MMSC horse in their barn. DP: Let’s talk about MMSC by the numbers. How many stalls do you have at MMSC? Does that determine the number of horses in training at MMSC? How many horses are in the MMSC barn at this time? ST: We have 10 stalls at MMSC, all named for donors who sponsored them, and 10-15 horses on the grounds at a time throughout the year. We try to keep them outdoors as much as possible, although we generally have five or six up at night if they need special attention. Over the year, we will move between 40 and 50 horses through our program. DP: How many staff and volunteers does it take to keep it running? ST: We have four full-time employees who handle the horse care, training, adoptions, marketing, educational outreach, fundraising and office management. We all do barnwork, and groundwork, whatever it takes, and we have a covey of the most wonderful volunteers and amazing interns to help us keep the place up. DP: Are you launching any new initiatives in 2019? ST: I am thrilled about a new program conceived of by our chair, Dorothy Crowell, an international level event rider and Olympian, granddaughter of Leslie Combs, a Thoroughbred aficionada, called the Allstar Program which aims to bring the Thoroughbred back to the highest levels of sport. There are many owners who get into the business of racing because of the love of the horse and seeing it compete. Dorothy’s thought was why does the fun have to stop when the racing days are done? For a cost that is minimal in comparison to racing expenses ($4,000 a year), the owners can support their horse–if it seemingly has the talent–in a competition syndicate and cheer it on, perhaps even to the highest levels of equestrian sport. We have one international level rider already, Jonathan Holling and his MMSC graduate Ragtime Rebel (Union Rags) who was given to us by Charlie LoPresti. And we have received quite a few calls from upper level riders all over the country who want to join the effort to showcase the Thoroughbred as America’s elite sport-horse. Now, all we need are more owners to join in. DP: The MMSC is located in the much-revered Kentucky Horse Park. Tell us how that affects the day-to-day operations of the MMSC and how has that location helped or hurt your mission? ST: The great thing about being in the Horse Park is that Lexington is not only the Horse Capital of the World, it is the Thoroughbred Horse Capital of the World. That gives us a huge stage from which to shout out the wonders of this amazing breed and the value of our industry. The challenges are that we have a very small campus, so we are limited to the amount of horses that we can take on. We also do tours and get many drop-in visitors which one might call “interruptions” because it does curtail our work routine. I take them not as interruptions at all but, as opportunities to share our passion and knowledge and make new friends for the MMSC and for racing. We are very proud of our location and we want to do anything we can to showcase the Kentucky Horse Park as the amazing facility that it is. We have discussed a variety of ways that the Horse Park and the MMSC can work together for the mutual goal of educating and celebrating the horse-in this case, the Thoroughbred horse. I would welcome the TB industry reaching out to us more and using our stage to broadcast their good works in aftercare. DP: What is unique or special about the training program at MMSC? ST: What is special about the MMSC is our laser-like focus on each horse–what it tells us with its body, its reactions, its actions. Then we make an individualized plan using the deductive skills of Sherlock Holmes and the compassionate tact of Anne Sullivan, Helen Keller’s companion, to search out the mysteries of each horse and to teach it in a way that it can best understand. Every horse receives, not only the dental and farrier care it needs, we also do bodywork, chiropractic adjustments, integrative therapies, proceed through desensitization and trust–building exercises using natural horsemanship, problem solving skills by introducing Tellington-Jones techniques. We start from the ground, lunging, and long-lining, and free jumping. DP: What is the biggest challenge facing your organization in 2019? ST: We have two huge challenges. The first is funding. I am honored that professionals and amateurs alike have called us the “Gold Standard of Thoroughbred Reschooling,” but Gold Standards are pricey to uphold. The racing industry is beleaguered by charities doing good work, but clamoring for the same funds. It is a constant struggle to be able to afford to give these horses what they need. The second challenge is that our campus is really small–17 acres of paddock. This limits the number of horses we can take in. Not only that we don’t have an indoor arena so training is often limited by the weather and the season. If we had more funding, we could solve both of those things, so I guess, the biggest challenge is truly funding. DP: You recently announced a satellite facility. Can you tell us a little about it? ST: It seemed to us that the way to help more horses was to open additional facilities. This was something the board had discussed over the years, but it seemed really challenging to find a way to ensure that our “Gold Standard” would be upheld. Over the last two years, the MMSC has adopted out five horses to the lesson program at a showcase facility in Frankfort, Illinois called the Ranch. As a result we have come to know Rick Bulthuis, owner of the Ranch in Frankfort Illinois and his general manager, Daniele Turner, really well and we realized that they were very much in line with our philosophy. We began talking about a satellite arrangement in the spring of last year and we are super excited to announce that we are open for business now in Illinois. In fact, in the short time since the announcement, we have adopted out two lovely reschooled horses from the MMSC at the Ranch. DP: Is there a horse you have in training today to whom you’d like to introduce us? ST: Yes, War of Ideas. He was a $470,000 sales yearling, who ran a bit, and was felled by a guttural pouch infection that threatened his life. 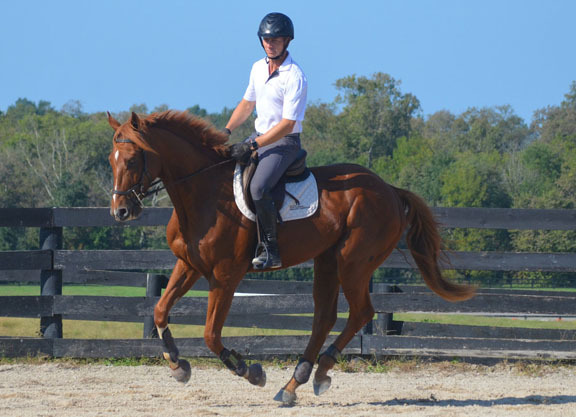 With the support of Dr. Liz Barrett at Hagyard Medical Center, he was nursed back to health at the MMSC and is the RRP Makeover horse of our talented trainer, Kara Toye. He’s a gorgeous, gray masterpiece of a horse–which goes English, or western, has a great jump, and is wonderful field hunter. Please follow him on our social media and come cheer him on at the Makeover! 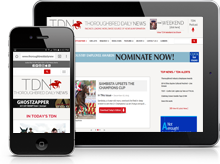 Diana Pikulski is the editor of the Thoroughbred Adoption Network.